Live in Croatia long enough and you’ll have to start paying bills or invoices, called “račun” in Croatian. May seem simple, but if you’re coming from abroad, it’s simply different than what you’re probably used to. When I first had to start paying bills, I was certainly confused so I’m wrote this post for everyone else who may also be confused from the start. There are a few ways you may receive bills/invoices and there are a few different ways to pay. We’ll go over all of them. There are many types of invoices, so let’s get a bit granular and start with the basics. If you purchase something in a shop or supermarket or a bakery, you’ll get a račun as it is required by law. It functions more as a receipt of payment, but it is still considered a račun. These types of invoices include electricity, water, garbage and city taxes for the apartment or house where you live. Maybe the bills come to you, maybe they come to your landlord. In my situation, all of these bills are mailed to me, but the accounts are in my landlord’s name. 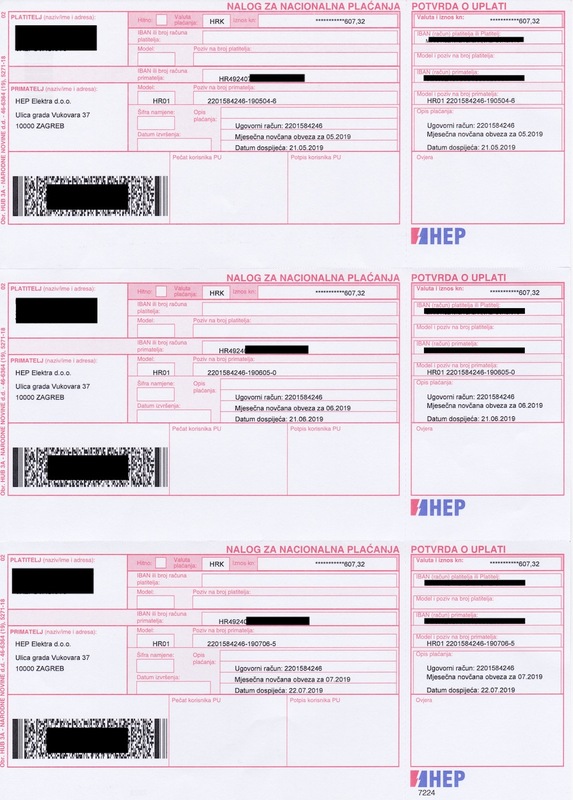 All printed utility bills come with a payment slip, called an “uplatnica”, that is usually outlined in red. You’ll see examples further down in the post. There are two types of utility bills that you’ll encounter. Your water bill is an example of a non-fixed utility bill. Your receive an invoice each month and the amount varies depending on your usage. For the water bill, it is not uncommon for you to report your water meter reading to your landlord or building manager on a monthly basis for calculation of what you owe. The garbage bill you receive from Čistoća is also an example of a non-fixed. This bill is calculated based on number of people in the household, so the amount is usually the same. The reason I am putting it in the “non-fixed” category is because it comes every month, or frankly whenever Čistoća feels like sending you one. Your phone, internet and television invoices are also examples of bills that are invoiced on a monthly basis. Each invoice will come with an uplatnica used for payment. We’ll get into that in a bit. There are certain invoices that will be sent you to you in batches e.g. you’ll receive 6 months worth of uplatnica at once. This does not mean you must pay all 6 months at once. I mean, you can if you really really want to, but it’s not expected. For example, HEP Elektra, d.o.o. (the state-run electricity company) uses averaged billing. Every 6 months, they look at your usage for the previous 6 months and create an averaged cost that you must pay every month based on that usage. For 6 months, you pay a flat rate for every month based on that average cost. At the end of that 6 months, they recalculate your usage again. If you prepaid more than what you used, then they will credit your next bill accordingly and your monthly payments for the next 6 months will go down. If you prepaid less than what you used, your next bill will include the difference you owe and your monthly payments will go up. HEP will send you 6 uplatnice at a time for the same amount, each with a different due date on them. It is your responsibility to pay each one at the appropriate time. Depending on your jurisdiction, you may also be required to pay a tax to your city. For Split, there is tax of about 58 kuna that must be paid every month to Grad Split. It’s a flat rate every month, but they send the uplatnice 6 months at a time just like HEP. Usually, you’ll receive one of these when you are purchasing a service or product from a business that you can’t physically visit or a government institution that doesn’t accept payments on site. Here is an example: Recently, I had some blood tests done at the hospital. Because I didn’t have dopunsko, the supplementary health insurance, I owed 50 kuna for these tests. About a week after the test, I received an invoice in the mail from the hospital. It did not include an uplatnica. We’ll address what to do in this situation further down. Here is another example: A few years ago, I bought a special edition National Geographic coffee table book of Croatia for my mother as a gift. They sent me an invoice by email, which I paid at the post office, which we’ll address further down. If you need to send money “on account” to someone, sometimes they’ll just give you their IBAN which starts with an “HR”. This technically is not an invoice, but it does fall into the arena of requesting a payment so I’m putting it in this list. Here is an example: I ordered olive oil from my favorite producer in Istria. They emailed me the IBAN number and amount to pay, with no invoice. We will not address the illegality of this right now. Here is another example: There is a cool printmaker in Split that I follow on Instagram. She created neat notebooks with an awesome octopus print on them that were for sale. She sent me her IBAN for me to pay. Here is yet another example: My friend and I split the cost of a gift for a friend getting married. She made the purchase, so I sent her money on account for my half. There are several ways to pay a business or a person. Let’s go through each one. If you do not have a Croatian bank account, then Pošta is an easy way to pay bills. Take your uplatnice to the closest location and you can pay by cash or card. They will charge you 6 kuna per bill unless it is for your health insurance to HZZO, in which case they charge a small percentage that comes to approximately 8-10 kuna. If going to the post office, I recommend going around 14:30. I have found this to be the sweet spot when the lines are the shortest likely because everyone is at home finishing their lunch. You can go in person to each utility or company to pay most bills, but don’t. Better to stand in one line at Pošta than in 6 different lines. 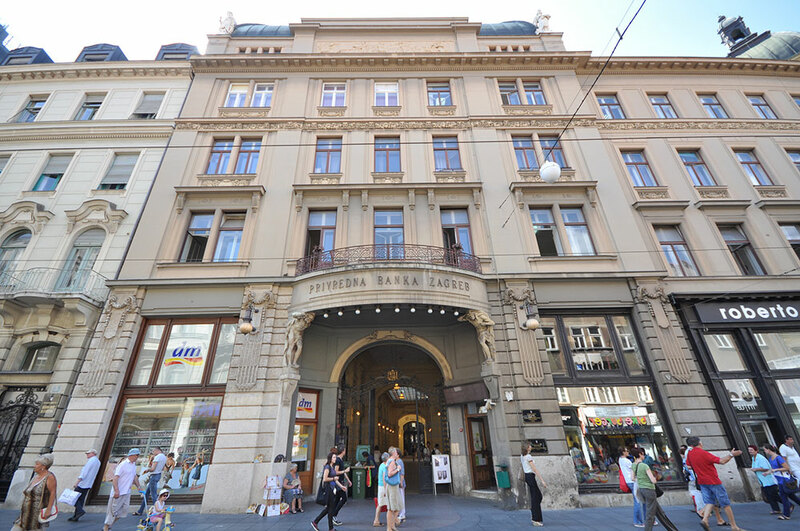 Paying through a Croatian bank account is the easiest and cheapest way to pay invoices. If you do not pay for bill payment, the fee to pay an bill is around 2 kuna depending on the bank. If you have bill payment on your account (which you have to pay for monthly), then there is no fee to pay a bill. There are also multiple avenues for paying a bill through a bank account. You can pay in person at your bank, through a mobile app or by logging into your account through a web browser. For the latter, you’ll need a little calculator-looking gadget that your bank will give you. Some utilities will allow you to set up a direct debit from your bank account to occur automatically monthly. To set this up, you’ll need to visit the utility directly to check if they offer “trajni nalog” and set it up. We’re nearing the promise land of adulting in Croatia. If you have a pre-printed uplatnica, then you are set. The Pošta can scan the barcode and immediately bring up the bill information to apply your payment. If you are paying on mobile app, you can scan the barcode using your phone to bring up the bill information. Then you just pay it. Then all you need is the IBAN and amount to pay. Make sure you put it in the right place, or the payment will not go through. Look for the fields marked “Model & Poziv na broj primatelja”. Put “HR” plus the next two numbers in the “Model” field. Then put the rest of the number in the “Poziv” field next to it. The bank will do the rest for you. If you’re paying your health insurance HZZO premium out-of-pocket (e.g. 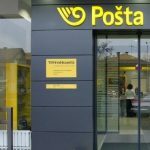 you are not employed by a Croatian company), they usually send two blank uplatnice every month along with your monthly bill. I stockpile these for when I need them. Platitelj – Put your name and address here. Primatelj – Put the person or company along with their address you are paying here. If it is a business, you’ll be asked to provide their OIB as well, which goes in this space. 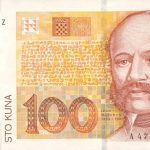 Valuta plaćanja – This is for the currency. Put “HRK”. Model & Poziv na broj primatelja – This is for the IBAN that starts with “HR” that you were provided by the person or business. It connects to their bank account. Put “HR” plus the next two numbers in the “Model” field. Then put the rest of the number in the “Poziv” field next to it. 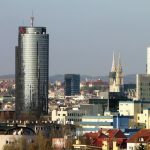 Opis plaćanja – This is the reason for payment. If paying an invoice, put the invoice number here. Duplicate all of this information in the secondary fields on the right side of the slip. This will be detached as your receipt of payment. Hooray! Now you can pay invoices in Croatia. Encountered any problems paying invoices? Let me know in the comments. 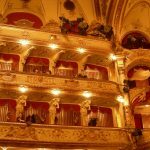 Good article which will be helpful to many. Can you tell me if I live out of Croatia, can a direct debit be set up for all utilities associated with home/apartment ownership? Eg garbage, electricity, water, and anything else? Some utilities will allow you to set up direct debit. You’ll need to speak to each utility directly to see if they offer “trajni nalog”. Another option is to prepay in advance, which would be easiest for electricity since it is flat rate.